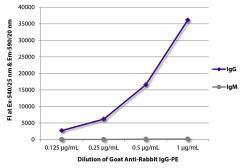 Specificity/Sensitivity: This antibody reacts with the heavy chains of rabbit IgG and with the light chains common to most rabbit immunoglobulins, but does not react against non-immunoglobulin serum proteins. 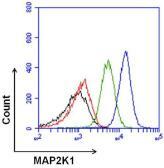 However, this antibody may cross-react with immunoglobulins from other species. 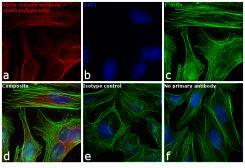 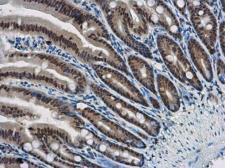 Specificity/Sensitivity: This antibody reacts to the Fc region of Rabbit IgG. 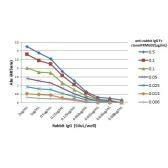 No cross reactivity with human IgG, rat IgG, or mouse IgG.